Inspired by sea glass and the romantic notion of messages in bottles, the Bottle Glass table lamp by Safavieh is ideal for coastal and transitional rooms. 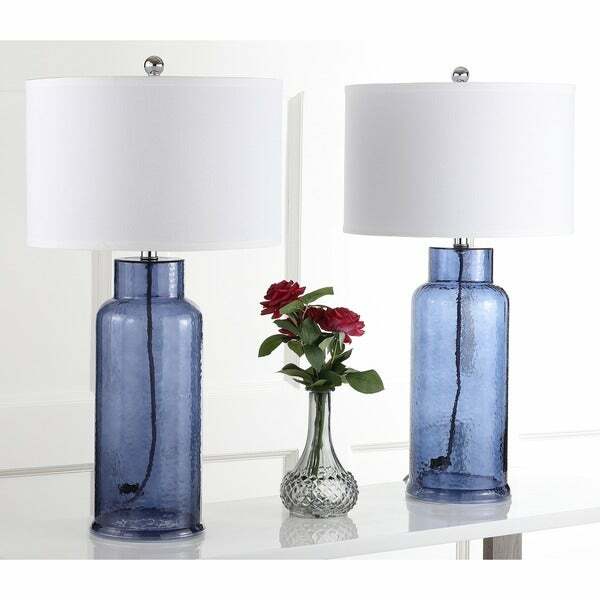 Crafted of clear blue glass with a silver neck, this pretty set of lamps features white drum shades. 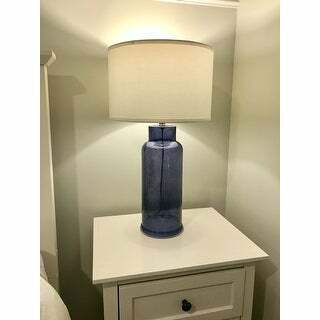 The Blue Bottle Glass Table Lamps are worth every penny. Quality is impeccable, very durable, great color, size is perfect and overall beyond satisfied with the purchase. I would recommend this product to everyone!!! Just received these lamps with shades today. I'm kind of disappointed. They're not as great as I thought they would be. The lamp itself is a really pretty blue color. There is no base under the lamp. The color appears to be painted on the glass. The worst part are the shades. The lamps and shades were really poorly packaged. The plastic covering on the shades wasn't wrapped tightly. There were brown spots and dirt marks on the shades. I don't think I would buy these lamps again. Love these lamps, happy with my purchase. Think the price was great, though it was the first time I had ever bought lamps with no bottom. Only complain is though the glass is pretty it seems very light weight for a lamp...I guess we'll see how long they last. The lamps arrived extremely well packed!! It took me over 30 min to unpack these. Good grief! What a mess afterwards too. Styrofoam, paper, cardboard, plastic, scissors, box cutter, trash bag, and I finally had the lamps out to start assembling. They assembled in about 10 min. I love the lamps except I wasn’t sure about the white rubber trim on the bottom. After a bit I don’t really notice it. I suppose it will be up to the beholder. Lamps are good quality and look beautiful. 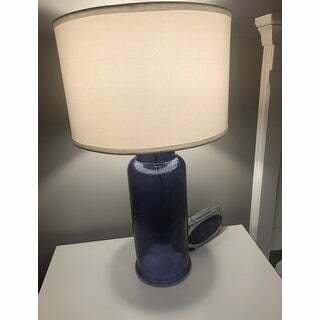 Love the texture of blue glass and color adds just enuf pop, heavy enuf that cat cannot knock over (bats at lamp shades), minus 1 star for lamp shades appear different shade when light on only. Overall they add a simple modern touch of elegance. These are very large, beautiful lamps. I bought two for our guest bedroom, and they are a nice pop of light. Would definitely buy again. Substantial and the perfect shade of blue. Not too cobolt... more like a light navy. Perfect! 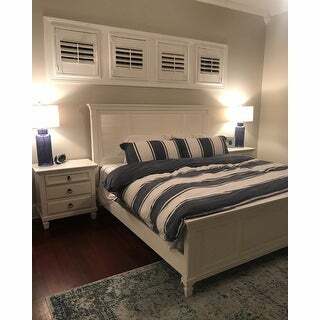 Safavieh merchandise are amazing I order from them all the time never once have I been disappointed or unsatisfied my blue lamps is bright and bring my curtains and rug out. Was. To happy with these lamps at all. Shades were dirty, where the base and neck came together fit loosely which made the shade sit uneven and it said bulbs included, there were none. Would not recommend. Look amazing. They are in a green and navy blue room. The glass looks amazing to break up the navy but still coordinates very well. Very cool lams. They were so much better then expected. The shades were large and crisp and the color was spot on. Absolutely perfect to elevate the style of the room. I love the color. The shade of blue is perfect to stand out from my brown and beige furniture. "How wide is that bottom of the base of the glass?" The dimension of the body is 7" X 7" X 17.25". "Can the glass globes be accessed to be filled with something like shells?" We do not recommend this as it can damage the wires inside the glass.